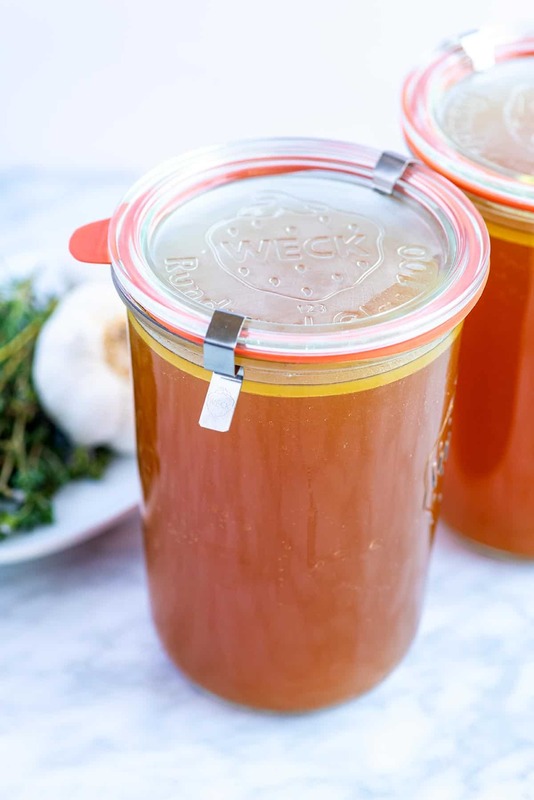 This homemade chicken stock will knock the socks of anything you can buy at the store. Use leftover bones or use chicken parts. Jump to the Homemade Chicken Stock Recipe or read on to see our tips for making it. Not only does this taste better than the box, it requires little effort from you. It even lasts in the freezer up to 3 months. 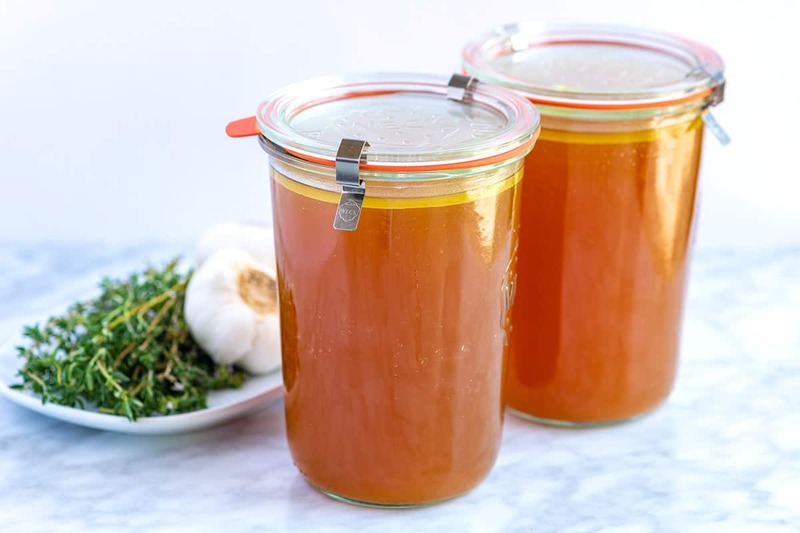 Homemade chicken stock is easy to make. 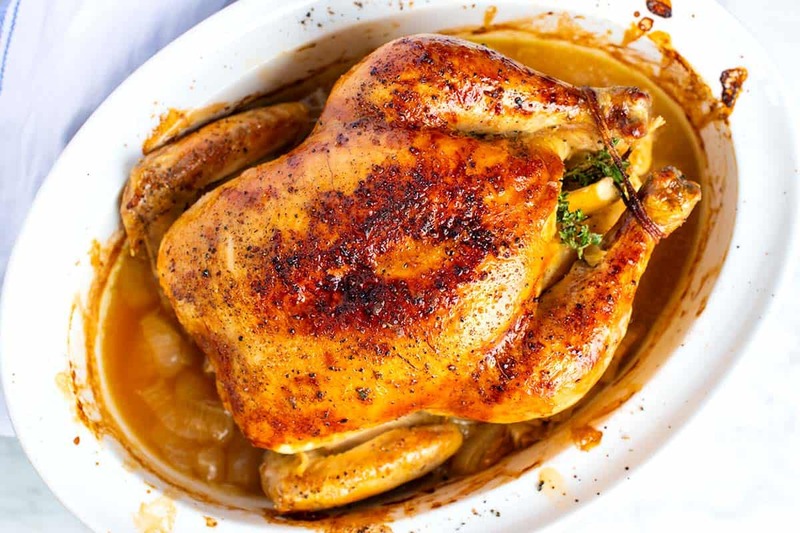 Use any part of the chicken — whole chickens, bones, wings and legs are excellent options. Leftover bones from roasted chicken also work really well. Add more or less chicken depending on how rich you want the stock. Our recipe below calls for 12 cups of water. For a light, but flavorful chicken stock, use about 4 pounds of chicken parts. For a rich ultra-flavorful stock, use about 8 pounds. Add plenty of aromatics. 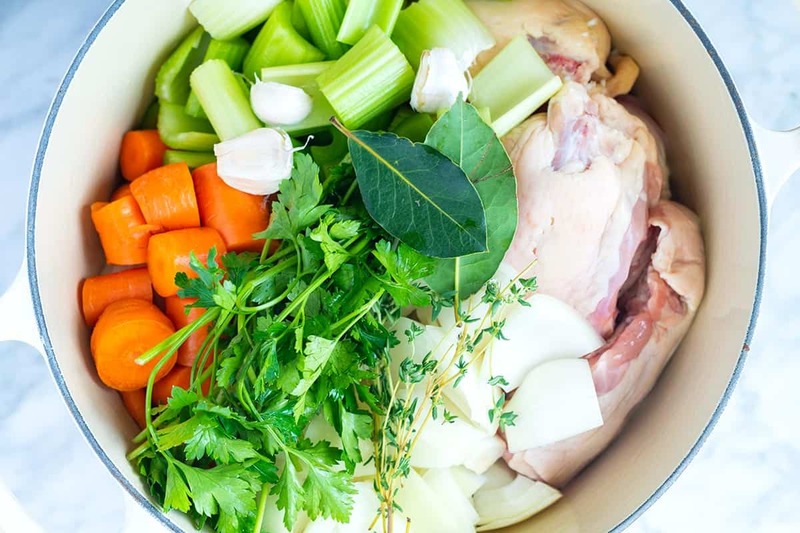 For the most flavorful stock, add chopped onion, carrots, celery and garlic to the stockpot as well as bay leaves, peppercorns and fresh herbs. Other vegetables like fennel and leek are excellent to add. Keep the stock at a gentle simmer. By keeping the stock at a low simmer while it cooks, we help keep the stock as clear as possible. 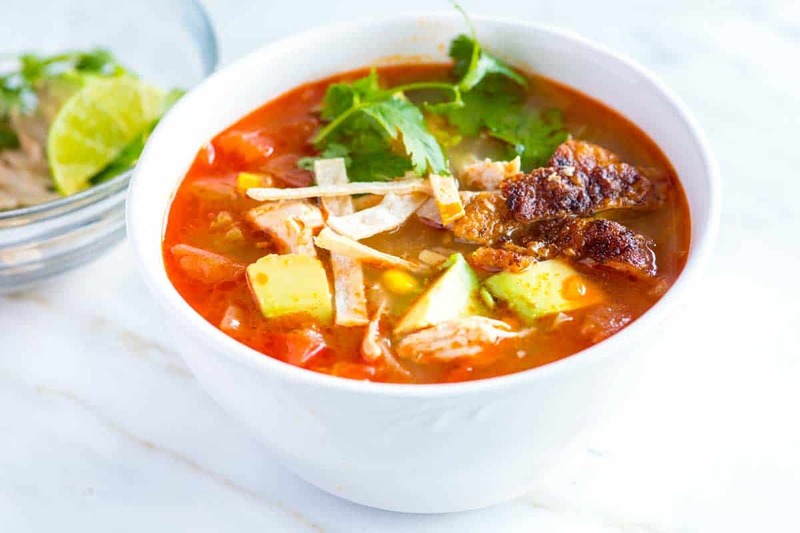 YOU MAY ALSO LIKE: This ultra-flavorful chicken tortilla soup is thickened with corn tortillas and has shredded chicken, ancho chili powder, corn and lime. Jump to the Easy Chicken Tortilla Soup Recipe. This homemade chicken stock will knock the socks of anything you can buy at the store. It requires minimal effort and can be stored in the freezer up to 3 months. Most often, we will use chicken wings when making stock — they are cheaper than other cuts of meat. That said, other chicken parts, such as whole chicken, bones, breasts, and legs will work nicely. Depending on how rich you want the stock, use more chicken parts. For a light, but flavorful stock 4 pounds of chicken parts will do. Use more for a richer stock. Place the chicken, onions, carrots, celery, garlic, bay leaves, thyme, parsley or dill, peppercorns and salt in a large stockpot. Add 12 cups of water and bring to a boil. Reduce the heat to low and cook at a gentle simmer, uncovered, for 4 hours. Taste and adjust with more salt as necessary. Strain the stock through a fine-mesh strainer and let cool until not hot. Transfer to containers and refrigerate until completely chilled, about 6 hours or overnight. Skim off and remove any fat on the surface. Refrigerate up to 5 days or freeze for up to 3 months. Nutrition facts: The nutrition facts provided below are estimates. We have used the USDA Supertracker recipe calculator to calculate approximate values. It was difficult to estimate actual numbers for this recipe. Instead, we are sharing the approximate nutrition for stock/broth from USDA Supertracker. After straining and skimming, broth has a low amount of calories and nutrients except sodium. Hi, I just want to say you guys are so awesome a real life saver. 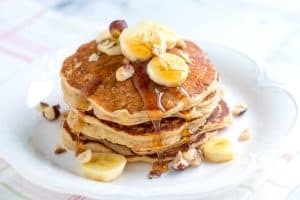 I recently got married and started to cook. I’d pick recipes from all over the internet & my husband was not very happy with them (don’t get me wrong he’s very appreciative of me cooking but none of them were his taste). One day I discovered your blog & decided to give it a go: I made the pulled chicken recipe & the tortilla soup and it was all golden from there! I’ve been making your recipes since then & really enjoying it. Your talents really shine through & you’ve simplified everything so cleverly it works nicely for working women & mothers. Thanks again! Hi! 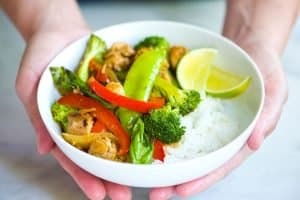 Is it possible to use a slow cooker for this recipe? That would be so awesome! Hi there, you can use your slow cooker. I’d expect that you will need to cook at HIGH for about 4 hours or on LOW for about 8 hours. I’d also suggest looking at our bone broth recipe. In that article/recipe, we share our method for using a slow cooker to make it. I don’t add salt to any stock. Leave that for whatever dish you’re using it for as many ingredients already have sodium content. Same thing for the garlic. 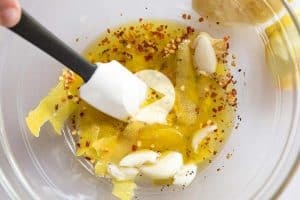 Many dishes don’t have garlic in them. Adding dill to the stock also limits it’s uses as dill is very powerful but seldom used in daily cooking which is what you’re making a stock for. If you put the herbs in a cheese cloth you don’t end up with little bits of vegetation that the strainer doesn’t catch. Those bits also end up rising to the top and getting trapped in the oil when you want them in the water. You also need to skim the natural scum that is released before straining it. I do that throughout the cooking period. With that scum I also skim the oil. If the oil has herbs in it they end up getting scooped up as well, another reason they should be in a cheese cloth. The refrigeration process solidifies the remaining fat making it easy to remove the last bits of it. Homemade stock is so easy to make and is waaaay beter than the store-bought stuff. 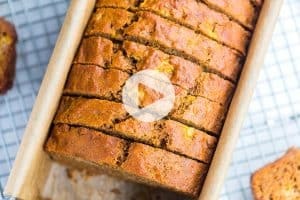 This recipe and technique looks like a keeper to me. Thanks Eliana, it is the technique I was taught in school. It leaves you with a simple, clear and delicately flavored stock.